Maurice Sikkink (lead developer) suggested his site via email and as usual I took some cooling time after initial pitch. There are many kinds of image-related sites and while conventional image editors are more functional overall, such mini-sites excel at limited but more complex transformations. Rollip targets giving photos polaroid and vintage look. Site takes photo as upload and applies one of multiply effects available. 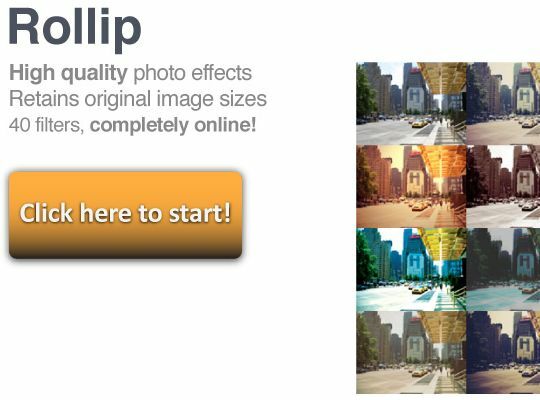 Process is very straightforward and previews of effects are easy to browse and choose from. I don’t feel that filters scream polaroid looks outright, but slant towards old washed-out looks is definite. Site is very clean and minimalistic. Absolutely nothing gets in the way and it is as focused on main function as possible. Selection of filters is extensive (even if somewhat boring) and works well with large images. After applying effect to photo site goes on to urge you to subscribe for account and get high quality processing. From mention of some kind of credits and googling around I understand that those are paid extras. Site itself has no information at all about benefits and/or pricing of account. This part is confusing and personally I don’t subscribe to sites that make no effort to explain what it’s for. Site definitely has function of aging photos covered and is easy to use. However part about accounts is obscure and feels out of place in otherwise polished experience.